Epic Win or Epic Fail? Most of us are familiar with GeIL Memory’s existence and while the company almost seems like that distant-aunt’s-cousin-whom-we-don’t-really-know over here at Custom PC Review, today we’ll be checking out a new line of products from one of their newest sub-brands, EpicGear. 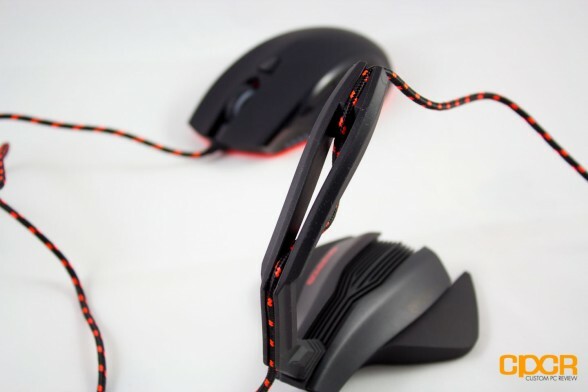 Being a newly established sub-brand, EpicGear doesn’t have many products in their lineup, but they were more than happy to share with us three of their newest products – the Meduza gaming mouse, the CompoXite gaming mouse pad, and the Skorpios mouse bungee. 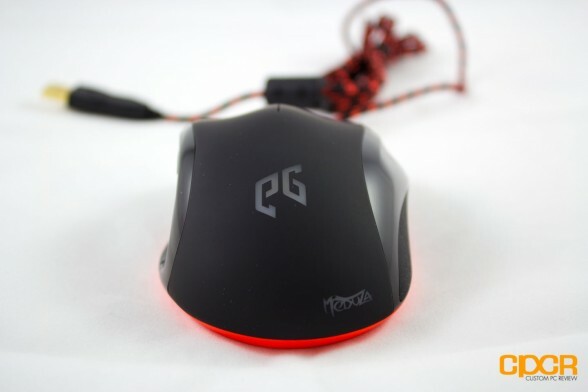 While each of these new products have their special features and we’ll be touching on each one of these products later in the review, the main topic of discussion for today is the EpicGear Meduza gaming mouse. What’s special about the Meduza is its ability to switch between the onboard laser and optical sensors as well as the ability to use both the laser and optical sensors in a hybrid, or HDST, mode. Additionally, it’s also got an onboard 32 bit Cortex-M3 CPU, 128KB onboard memory, braided cables, and more. 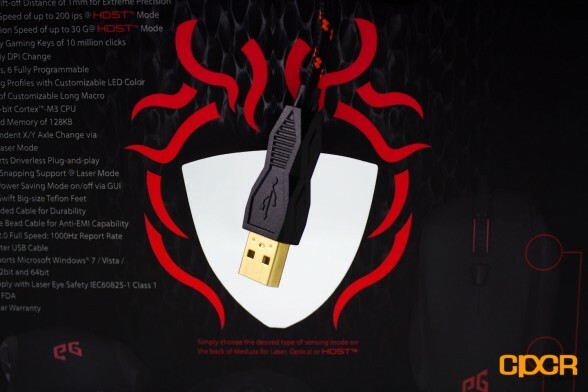 GeIL’s move into the world of gaming peripherals is a bold one, but not an unfamiliar one, especially with the likes of memory giant Corsair (quite successfully) hopping into the gaming peripherals mix last year. That said, with peripheral veterans like Razer and Steelseries running around dominating the market, will EpicGear with their new line of products have what it takes to compete with the best? Let’s find out! 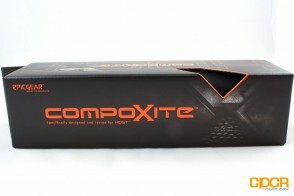 Here’s a look at the box for the EpicGear CompoXite mousepad. 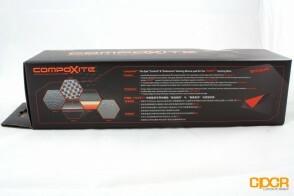 The CompoXite mouse pad is a cloth based mousepad that measures 380mm x 270mm x 3mm (medium sized). It also features a 3D textured pattern, which according to EpicGear helps maximize control. 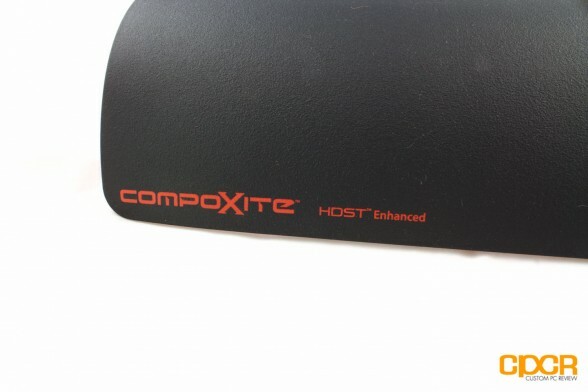 According to EpicGear, the CompoXite’s design is specially suited to be used with their HDST sensors as the “Uniquely designed weave pattern with gaps between threads letting the bottom neon- orange silicon layer to show through and be picked up by the HDST™ sensors for enhanced catoptrics resulting in superior sensitivity”. The corners of the CompoXite are rounded, which prevents mouse cable interference when rubbing against the edge of the mouse pad. The mousepad is also crafted using a high wear resistant fabric and is finished in a water resistant finish as well for added durability. 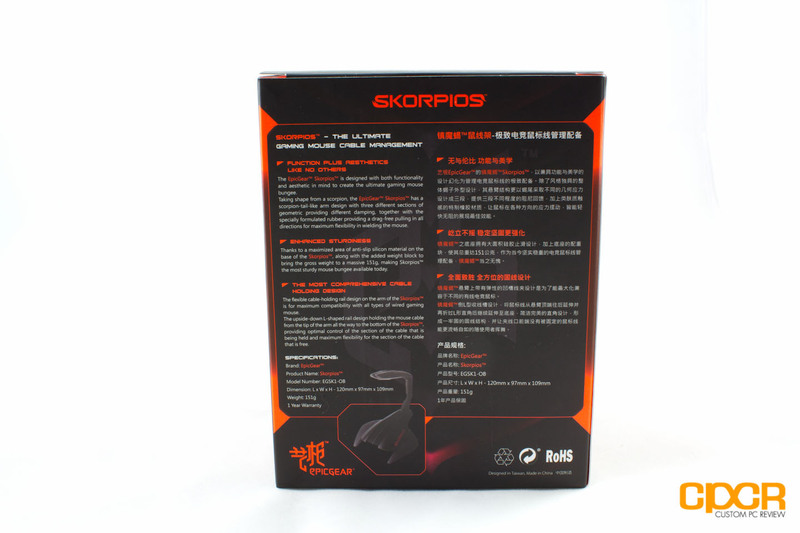 Here’s a look at the packaging for the Skorpios. 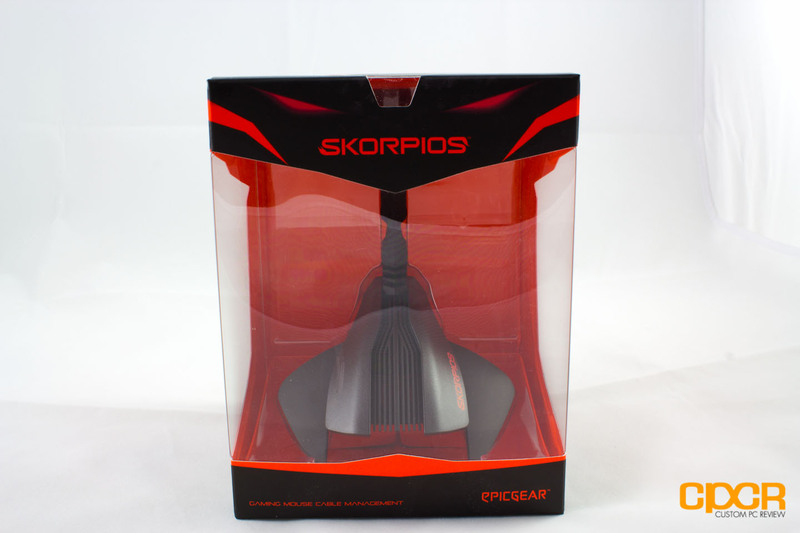 The Skorpios is EpicGear’s mouse bungee which holds the cable of the mouse so it doesn’t get caught somewhere as you are gaming. The mouse cable snaps into the canal on the tail of the Scorpios. The tail itself is quite flexible to to provide a bit of additional travel for the mouse in case of a long tug. Here’s what the Scorpio looks like with the Meduza’s cable attached. 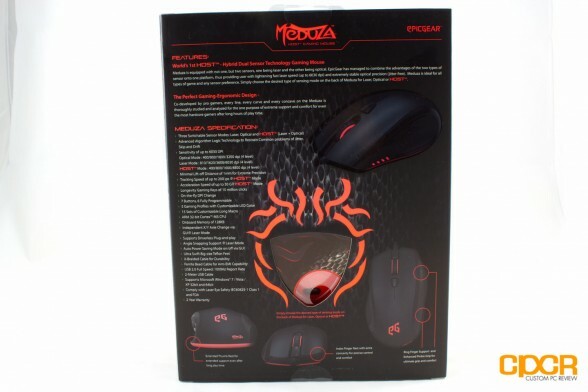 Here’s a look at the packaging for the Meduza gaming mouse. There’s a shield-shaped cut-out at the back of the box that’s supposed to showcase the dual sensors on the Meduza, but unfortunately the driver disk in my sample slipped out of its holding area and covered it up. With everything out of the box we can see that the Meduza comes with very little extras. The only thing included was the driver disk and a quick start guide printed directly onto the back cover. 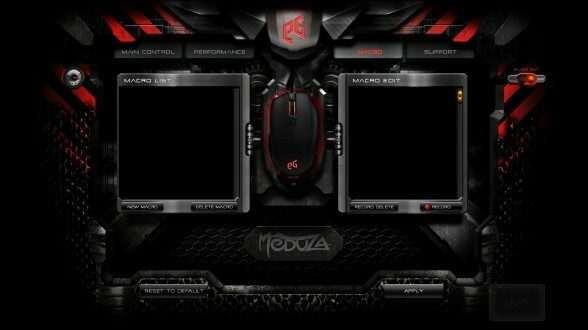 My first impression of the Meduza is that it looks freaking good. It’s quite rare these days that we come by a relatively new product with such excellent aesthetics. 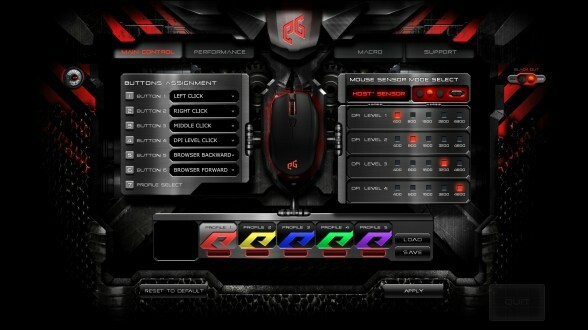 The front of the mouse is home to the left and right mouse clicks accompanied by the scroll wheel and a programmable button. From the rear we can see its large, elevated back which hints that it’s fitted for palm grip. Both the EpicGear (EG) and the Meduza engravings light up during operation. 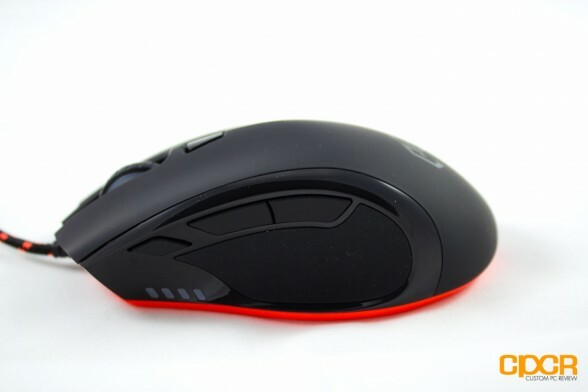 Also, if you look carefully, you can see that the top of the mouse is not in a rounded dome shape and instead depressed to provide the fingers with a more comfortable fit. 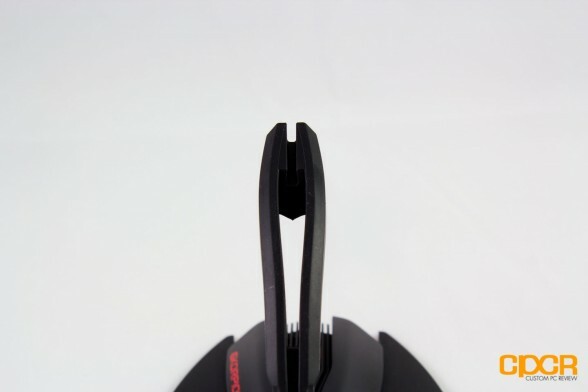 The right side of the mouse has a small patch of rubberized material to improve grip, which is something we always find. However, what EpicGear did that I’ve yet to see any company do is provide a resting area for your index finger. It’s a little hard to see in this shot due to the glossiness of the plastic, but there’s an indent right above the rubber patch for you to put your index finger on. The left side of the mouse has a larger patch of rubber to give your thumb a full grip. 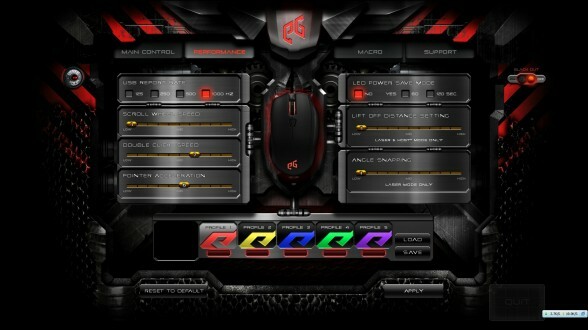 On top of the grip are the two side mouse buttons and a DPI adjustment button in front of it. The Meduza has 4 user defined DPI levels. 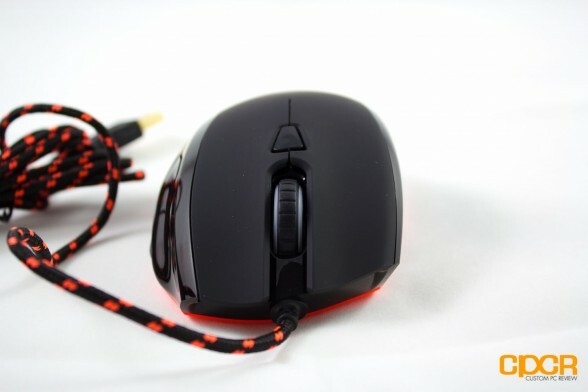 The four little indicator LEDs underneath the DPI adjustment switch are actually a series of LEDs that indicate which level of DPI your mouse is currently set to. 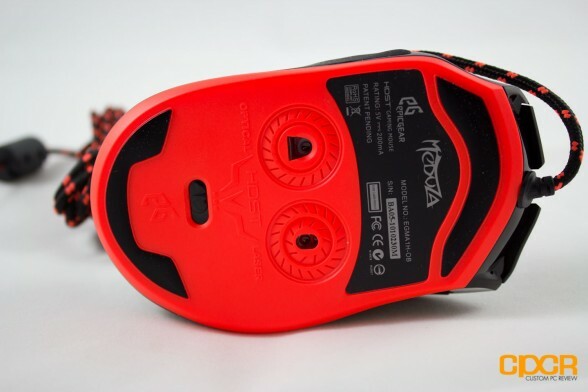 Turning the mouse upside-down, we are greeted with a sick looking RED bottom… and a giant happy face! (Am I the only one who sees this?) Here, we find one of the main selling points of the Meduza – the dual sensors. We get both an optical sensor rated at a max DPI of 3200, and a laser sensor rated at a maximum of 6000DPI. EpicGear also gives you the option of using the two sensors in conjunction with the HDST mode. The sensor mode can be selected via a physical switch. Down here, we also get two teflon feet. Although described by EpicGear as “big-size”, they seem kinda small to me. EpicGear has went with a nice looking braided cable with the Meduza. 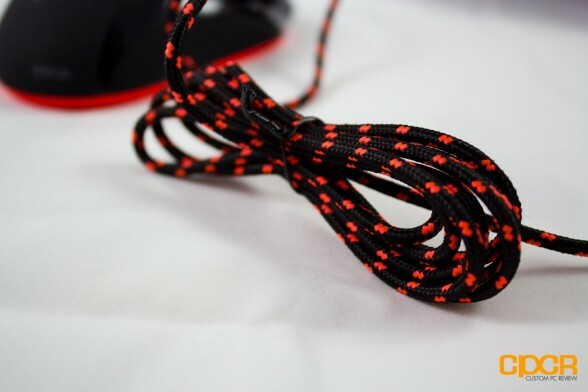 It feels extremely durable yet is still flexible unlike some braided cables out there. The Meduza does use a USB connection and supports “plug and play” function. The head of the USB is gold plated to resist against corrosion and weathering. When I first fired up the driver software for the Meduza, I was caught completely offguard. Why? It made my desktop disappear. Yes, the driver suite actually took up my entire screen. I can’t possibly imagine why anyone want to see nothing but a configuration software, but that’s the decision EpicGear decided to roll with. First tab is the main control, which just gives you an over view of some general settings like setting up simple functions for the buttons and change the DPI settings for the three sensors. Do note that you can only adjust the X and Y sensitivity with laser sensor, the HDST and optical sensors do not. Along the bottom is the profile management tab. Each profile will make the Meduza glow a different color to make them easy to distinguish. Next we have the performance tab where you can adjust the liftoff distances, wheel scroll speed, acceleration etc. In the macros tab, we get to record or program more complex macros for the buttons. Last but not least, we get the support menu. Here we get links to the website to update firmware, update drivers, etc. Overall I’d say the software is lacking a bit of the polish, but overall it does its job fine. The CompoXite’s semi-large profile actually took up quite a bit of space on my desk despite this being a medium sized gaming mousepad. The silicone bottom layer provided excellent traction and it did not slip or shift even as I purposely tried to push it around with my fingers. The top of the mouse pad was also solid and very durable as expected. The composite fiber was extremely well woven and I felt an immediate increase in control and reduction of friction compared to my cheapo retail brand mouse pad. 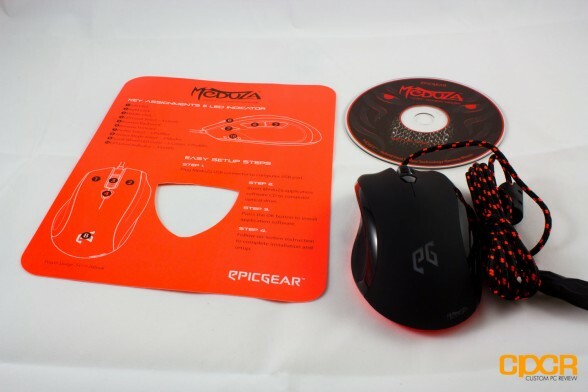 As mentioned earlier, EpicGear is advertising that the top surface’s woven fabric is designed specifically for HDST sensors, which means only the Meduza would be able to detect the red layer beneath the top layer for enhanced detection, but I didn’t detect any noticeable difference in performance between the Meduza and my SteelSeries Sensei Fnatic. To test its resistance to moisture and accidental spillage, I poured 10 mL of water on its surface. The water did not seep through the mousepad. After wiping away the water, I found the surface fabric to be a little damp, but not wet enough to need be hung out to dry. Water resistant? Sure. Water proof? Nope. On my personal gaming setup, I have most of my mouse wires hanging off the table rather than sitting on the table (I hate ugly cables on my desk), which creates a lot of resistance especially as I’m moving the mouse downwards which requires the cable to be dragged onto the table – a result of both friction between the table and the cable as well as gravity’s pull on the cable. On the same token, when I’m pushing the mouse upwards, gravity is able to pull the mouse cable off the table, which causes less resistance when the mouse is moving upwards and more resistance when the mouse is moving downwards. Hopefully this made sense. The Skorpios solves this issue very effectively as it provides a pre-set amount of slack, so there’s no difference in resistance when moving the mouse around. The laser sensor on the Meduza was quite stable. While testing for acceleration in Team Fortress 2 (with raw mouse input enabled), I detected a small bit of positive acceleration. 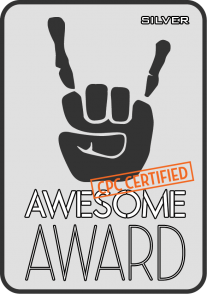 This was undesired, but the effect wasn’t great enough to hinder my ability to mow down my enemies. Setting the sensor to the maximum DPI of 6400, my mouse pointer became a little jittery. This only became apparent when I tried to make fine slider adjustments in applications such as Adobe Lightroom. No angle snapping was detected, but the off-centered placement of the sensor caused some problems as it polled in the wrong direction when I turned it with my wrist. As expected of optical sensor technology, the optical sensor on the Meduza was exceptionally stable. 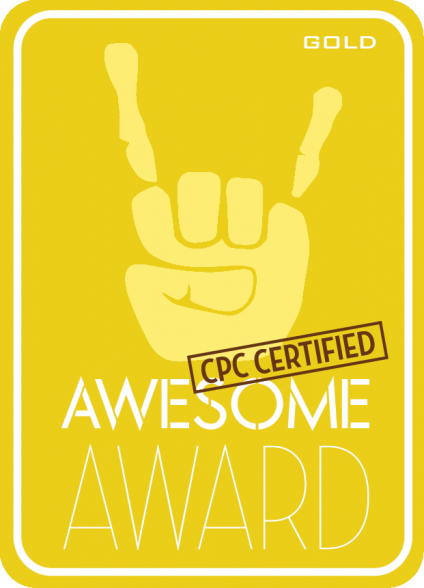 It was able to accurately relay my hand movements with zero jumps and shakes. Acceleration was not of an issue. Again, the only issue that somewhat crippled its otherwise excellent performance was its off-centered placement, which caused many weird poll directions when I turned it with my wrist. The HDST function uses on-board algorithms that utilizes both the optical and the laser sensors on the Meduza to create a virtual sensor that’s simulated to rest in the center to eliminate the polling issue associated with the off-centered sensors. With the HDST sensor selected, the incorrect polling was dramatically alleviated and the mouse pointer became more intuitive to control. At the maximum DPI, the HDST sensor saw a little bit of jitter, but was overall stable throughout testing. No acceleration was detected either, which is quite surprising to me as the laser sensor did encounter some positive acceleration. Also, like the rest of its sensors, angle snapping was not of concern. In terms of ergonomics, I think this is really where the Meduza shines, especially for those who prefer to use the palm grip. The Meduza’s uniquely shaped chassis gave all of my fingers their own resting area, which made this mouse very, very comfortable. Its gripped back supported my hand very well and fit snugly in my hand. The side rubber grips was placed right under my fingers and provided ample of control. All of the mouse buttons were responsive and easily accessible, although the left and right mouse clicks were quite loud and had a long-ish travel distance. 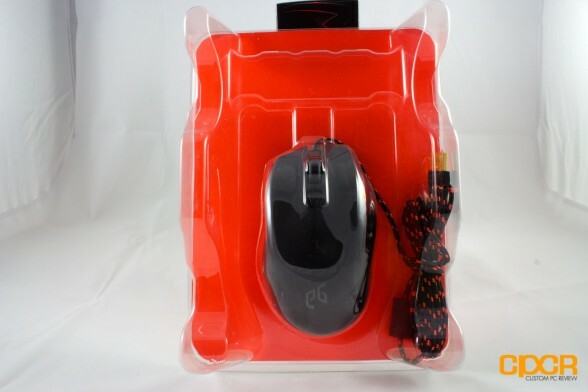 The small Teflon mouse feet raised some concerns about long term durability, but they had no issues gliding on top of the CompoXite mouse pad during testing. 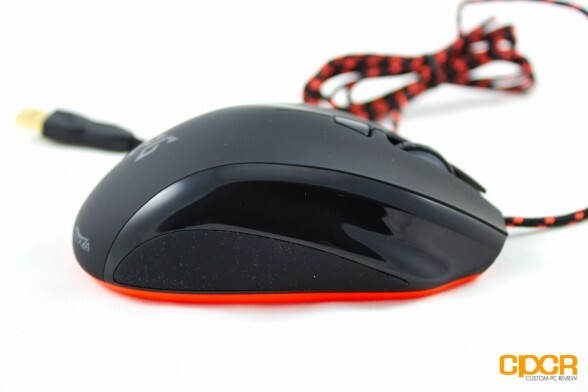 As this is a palm grip type of mouse, it is slightly heavy for those who are looking to use this as a claw or fingertip grip mouse. 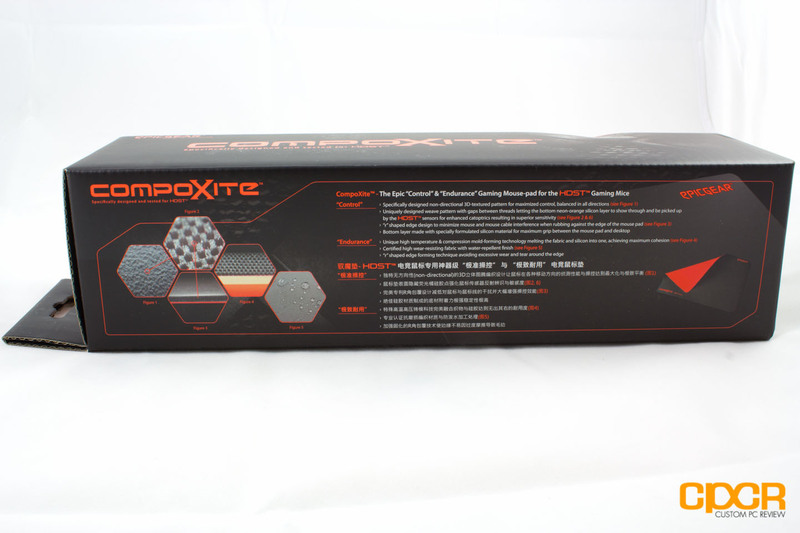 The CompoXite mouse pad is the epitome of a classic gaming mouse pad. 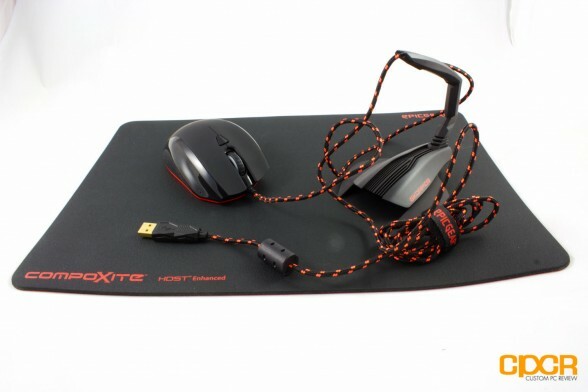 It has everything a good mouse pad should have – incredible durability, smooth surface, and great aesthetics. Compared to the cheap bundled mousepads, it blows them out of the water in both quality and performance. Even against some high end mousepads the CompoXite will give even the best out there a run for their money. 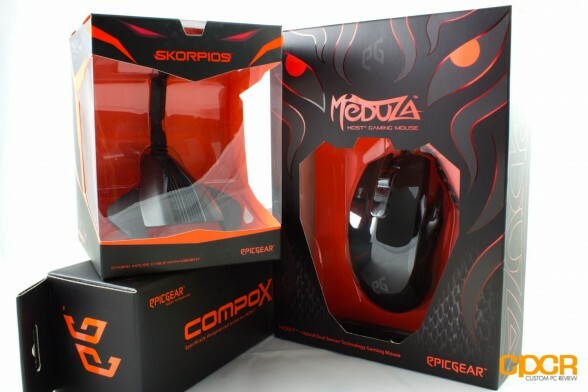 Contrary to the texts on the box, I didn’t see a difference in performance using the CompoXite with the Meduza and the SteelSeries Sensei my SteelSeries Sensei despite EpicGear’s claim that the orange bottom layer gives the Meduza the edge. The EpicGear CompoXite tested today is currently available at Newegg for $34.99. 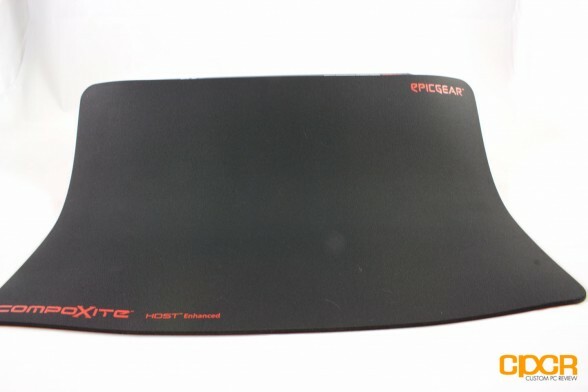 It’s definitely not the most inexpensive mousepad on the market, but if you’re looking for a nice, high quality, cloth based, control mousepad, you might find that the EpicGear CompoXite mousepad is exactly what you’re looking for. That said, at this price there are plenty of alternatives out there such as the Razer Goliathus Control ($19.99) or the SteelSeries QcK+ ($16.99) that also provide an excellent surface at nearly half the price. Overall a fantastic product from a relatively new peripherals manufacturer. 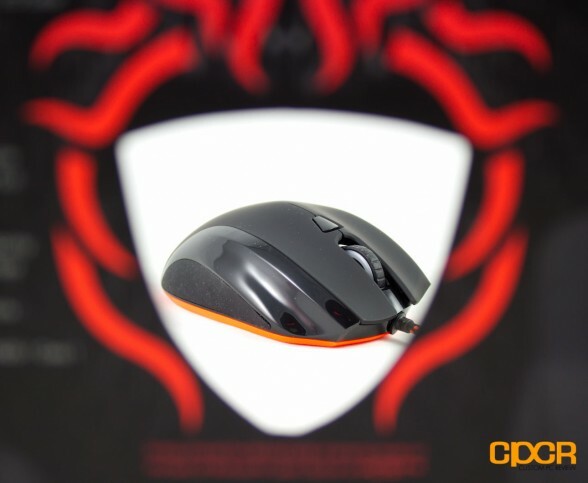 No-frills design combined with incredible performance, the CompoXite will make any mouse happy. Just be prepared to shell out a bit more for the privilege. 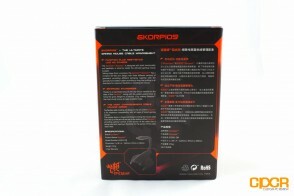 The Skorpios mouse bungee is simplistic in the extreme, but it does its intended job, and it does it well. 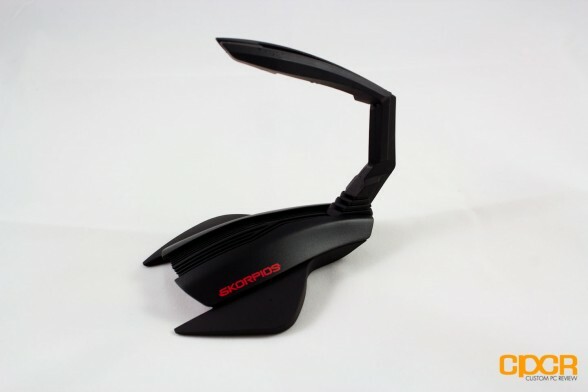 The tail of the Skorpios tightly held the mouse cable in its grip and prevented it from grinding against the edge of my desk. The hefty weight of the Skorpios also kept it from sliding around on my desktop. The tail of the bungee dips a bit to give some room for strong tugs and pulls, which helps to keep it upright. Overall, I found this product to be one of those things that you don’t realize you need, but once you get it, you can’t live without. The price of the EpicGear Skorpios is currently $30.99, which is a serious premium to pay for a product that’s essentially a fancy brick. 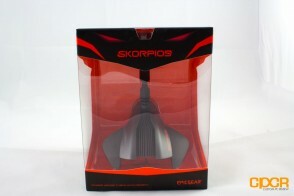 That said, if a brick is too “cheap” of a solution for you and mouse cables getting stuck is seriously affecting your game, then yeah it may be a good investment to grab a Skorpios instead. With a design that takes up very little desk space, and its hefty 151 g of body and silicon feet keeping it upright despite some stronger tugs and pulls, the Skorpios was able to do its job quite well and manages to look pretty good in the process. The Skorpios may be a luxury to some, but a necessity to others. Do you really need it? That’s for you to decide. With a ton of cool features, it’s clear that EpicGear engineers have really poured their heart into designing the Meduza. The comfort level of this rodent is absolutely phenomenal it’s literally the most comfortable mouse I have ever laid my hand on thanks to the dedicated finger rests, especially the space reserved for the ring finger. The dedicated ring finger resting area turned the clumsy ring finger that would otherwise feel out-of-place on plain dome-shaped mice into an additional means of control. This is a huge game changer and I would definitely like to see more companies follow suit. The buttons on the Meduza are all very responsive and easy to reach, but the longish travel distance and the loud clicks may turn some people off. The Meduza’s performance makes me smile one second then frown the next. With 3 sensors in its belly, it gives the user the freedom to choose between maximum stability (optical), super-high DPI (Laser), or a hybrid of both (HDST) depending on the task at hand. The sensors are all of excellent quality and produced minimal jitters in the test benches. But do keep in mind that although there are three sensors to select from, I only found the HDST sensor to be free of the annoying polling problem that stems from the off-centered sensor placements. This problem is worsened by the fact that the optical and laser sensors are placed on opposite sides, which makes switching between sensors even harder to adjust to. Fortunately though, the optical and HDST modes are free of any acceleration issues, which is one of the biggest issues of having a laser only sensor. The teflon feet seemed a bit small, but they offered no resistance during the tests. Personally, I would have liked them to be just a tad larger to offer an even better experience. The driver of the Meduza is…interesting. Unless you really like your driver menu taking up your entire screen, forcing you to press alt+tab every time you want to switch applications, then the Meduza’s driver software will drive you insane. What’s worse is the crappy sound effect it plays every time you click on something, anything. All the settings and features are there, and I can’t really complain when it comes to ease of use, but I really hope that EpicGear will release some sort of a driver update for the interface. Maybe make it less in your face, or just scrap it completely and make something new. 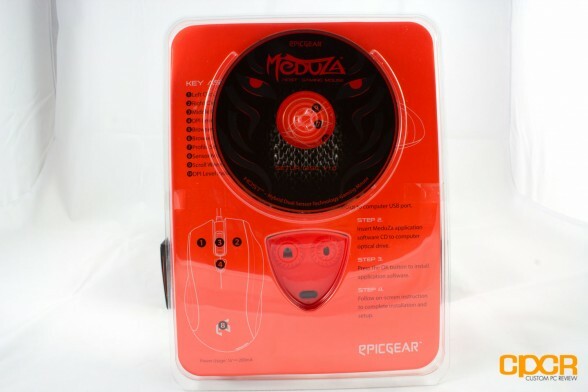 The EpicGear Meduza can be had for $80.99 on Amazon.com. In my opinion, it’s a very reasonable price for what you are getting. 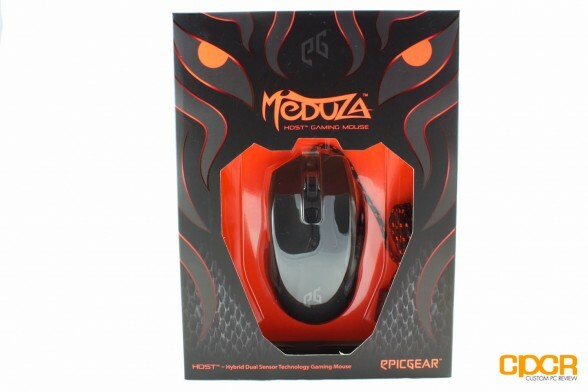 But unfortunately for EpicGear, the Meduza steps into the territory of the SteelSeries Sensei Fnatic ($79.53). 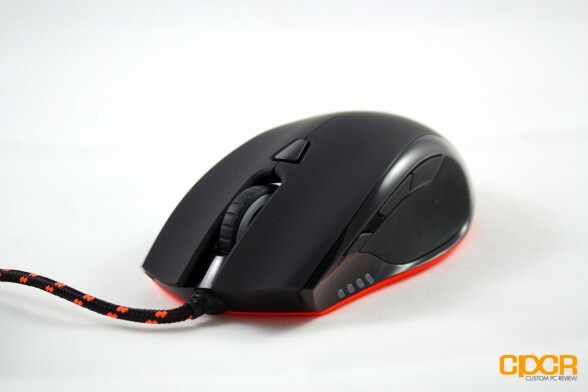 Although the Meduza is not a bad mouse by any stretch, I can’t recommend it over the SteelSeries Sensei Fnatic simply because the Sensei doesn’t have polling problems, needs no drivers to change its settings, and is also a damn comfortable mouse. 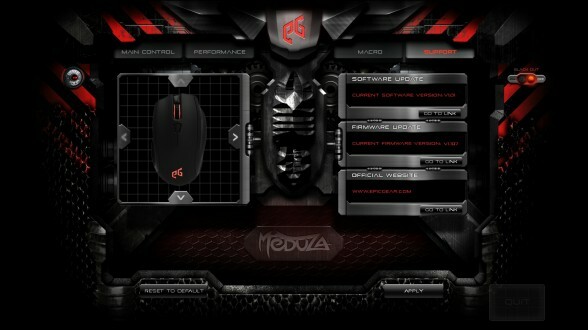 The Meduza’s got the edge on the sensor count, but also have edgy sensors. The off-centered sensor placement makes this rodent a little difficult to control if the laser and optical sensors are used individually. But you are not going to find anything more comfortable. It’s in the works; however, I’m told by Razer that it will not be available until Q1 2013.